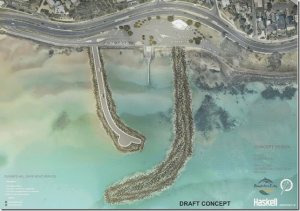 The following is information relating to the proposed Olivers Hill boat harbour. It’s a controversial matter and as such it’s important that members be given the opportunity to express their own views on the matter. One thing is certain, whatever the decision we will be stuck with the consequences (good and bad) for a very long time (generations probably), so it’s important that many locals express their views. The survey link can be found below the details of the consultation sessions. It makes for interesting and thought provoking reading. Your feedback is important and will guide next steps in the development of this project. A survey will be available online for you to complete from Tuesday 4 December 2018 to 30 January 2019. Breakwater arms are 200m and 314m; pier is 271m; jetty is 50m. This entry was posted in Environment, News, Planning, politics and tagged breakwater, Coast Guard Facility, Frankston. Kananook Creek, marina, Oliver's Hill, safe boat harbour. Bookmark the permalink.